VANCOUVER, Wash. — May is Volcano Preparedness Month in Washington state, providing residents an opportunity to become more familiar with volcanic risk in their communities and learn about steps they can take to reduce potential impacts. This year, Volcano Preparedness Month coincides with the 35th anniversary of the May 18, 1980 catastrophic eruption of Mount St. Helens. The eruption of Mount St. Helens caused massive destruction and loss of life. It also, however, was a catalyst for a new era of unprecedented scientific discovery, technology development and community awareness. The Washington Military Department’s Emergency Management Division, Washington Department of Natural Resources, the Pacific Northwest Seismic Network and the U.S. Geological Survey Cascades Volcano Observatory are working together to provide timely warnings and reduce the negative impacts of future eruptions. Together, the agencies develop and exercise emergency plans with communities, coordinate communications, conduct public education programs, and plan for short- and long-term recovery in the event an eruption or lahar should occur. On Sunday, May 18, 1980 at 8:32 a.m., the bulging north flank of Mount St. Helens slid away in a massive landslide. Seconds later, the uncorked volcano exploded and blasted rocks laterally, destroying centuries of forest growth in a span of several minutes. Nine hours of explosive volcanic activity ensued, altering the landscape, and what we know about volcanoes, forever. The opening minutes of the eruption claimed the lives of 57 people. Winds transported 520 million tons of ash across the United States, producing darkness in Spokane, more than 250 miles away. Water from melting snow and ice mixed with loose rock debris to form lahars – volcanic mudflows – that poured down river valleys ripping trees from their roots and engulfing roads, bridges and houses. Thirty-five years later, excess sediment still moves down those river drainages most affected by erupted debris on May 18, creating flooding issues and impressing upon all that hazards can persist long after an eruption is over. The eruption left an indelible effect on the regional economy and lives of citizens in the Pacific Northwest and beyond. A diary of daily happenings during 1980 is posted on the USGS Volcanoes Facebook site. Mount St. Helens is a volcanologist’s ideal laboratory. The landslide exposed the interior of the mountain. This affords scientists with unprecedented access for examining deposits, installing monitoring gear and conducting tests that provide new insights about volcano dynamics. Eruptive activity helps scientists to draw correlations between monitoring signals and impending eruptions. “The true legacy of the Mount St. Helens eruption has been the long-term opportunities that it has given scientists to understand explosive-style volcanoes, and for raising public awareness about hazards in the Cascades,” said Carolyn Driedger, hydrologist and outreach coordinator at the USGS CVO. Recent eruptive events at volcanoes in Chile and Japan are reminders that volcanoes can reawaken very quickly and that preparations must be accomplished in times when the volcano is quiet. During September 2014, Ontake Volcano in Japan erupted with only a few hours of precursory earthquakes, and claimed the lives of 63 people. In April 2015, Calbuco volcano in Chile provided similar short notice and displaced more than 6,500 people. This year, various agencies are involved in mitigation measures, including updating emergency coordination plans, making public education presentations and posting signs in communities. A schedule of events is available online. The USGS CVO and PNSN work to improve eruption forecasting and warning capabilities for Cascade volcanoes as part of the National Volcanic Early Warning System. They continue to monitor Mount St. Helens and other volcanoes in the Cascade Range for signs of unrest. The monitoring network operated by USGS and PNSN enhances the likelihood of detecting preliminary signs of an impending eruption at Mount St. Helens at its earliest stages. The USGS CVO website has information about Volcano Preparedness Month events, as well as the USGS volcano-monitoring program, and the hazards in Washington and Oregon. Register for weekly updates and occasional Information Statements from the USGS Volcano Notification Service. The University of Washington’s PNSN tracks earthquake activity in the Cascadia region including those under the Cascade Volcanoes on their Volcano Seismicity web pages. Washington state’s Emergency Management Division website has a section about the state’s volcanoes as well as volcano preparedness measures. There’s also educational material for kids on its publication section. Follow the agency’s Twitter feed for breaking news and information. The Washington state DNR’s Division of Geology and Earth Resources produces maps, assessments and other information to inform landowners, residents, community leaders and emergency personnel about the risks related to volcanoes, lahars and other natural hazards in Washington state. 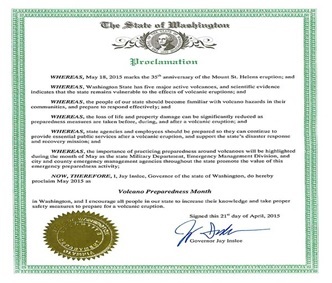 The State of Washington Proclamation for Volcano Preparedness Month.